Many developers prefer to use exception tracer tool in their DLLs. Exception tracer collects information about problems in your code, allowing you to diagnose failures more easily. Exception tracer includes its code in your module. It also injects some data - debug information and options. 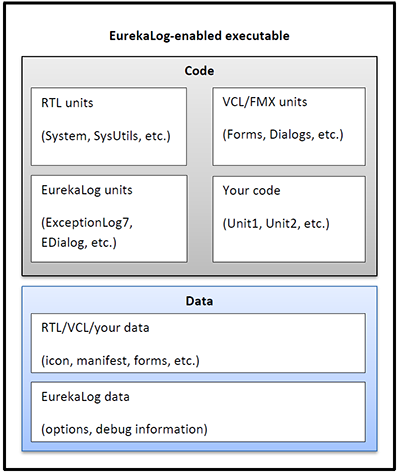 Both (code and data) are required for exception tracer to function. First case is good when you can afford enabling exception tracer in host application. Centralized management will allow you to reduce performance cost when you have many DLLs. For example, consider application with 50 DLLs (keep in mind "plugins" scenario). Each exception must be analyzed by exception tracer. If each DLL has its own exception tracer - then each exception will be analyzed 50 times. A good idea would be to have only one instance of exception tracer, so information is collected only once. Any DLL can ask central exception tracer for information about exception. Second case is good when host application is out of your control. Since you can not use exception tracer in host - then the only choice left is to add it to DLL. Each DLL will have its own isolated exception tracer. Examples are ActiveX (host will be Internet Explorer), COM (host can be Microsoft Office), etc.